Lots of bumps when you go long. 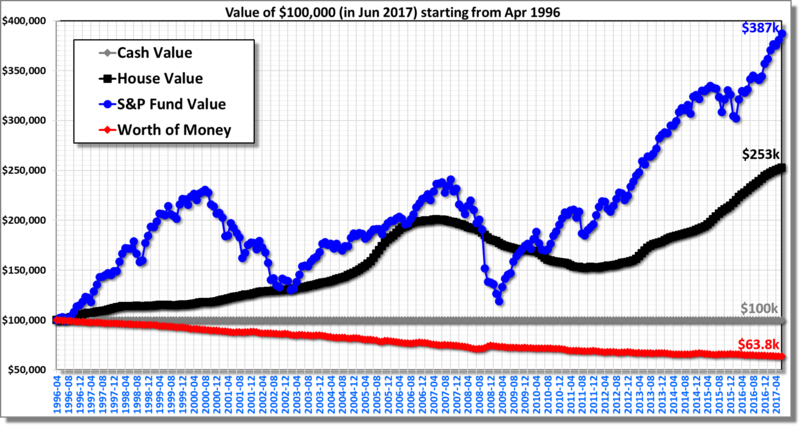 A longer trend comparing cash, housing and S&P (with dividend invested) – starting in Jun 1994. Same comparison as yesterday (Aug 14, 2017), plotted for longer period. The S&P index doesn’t look as rosy as before due to two big dips along the way. But it still beats the house appreciation. This picture does suggest that house prices in Portland Metro have crossed the 2006 peak (in absolute terms). Click on image to enlarge. Sources same as yesterday (Zillow & Prof. Shiller’s data).